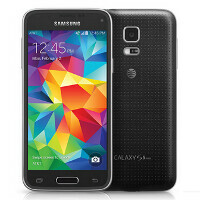 This coming Friday, March 20th, the Samsung Galaxy S5 mini will be available from AT&T. The phone will be priced at $99.99 with a signed two-year pact. Off-contract, the device will cost you $428.99. Those using AT&T Next can pay $14.30 a month over 30 months or $21.48 a month over 20 months. The phone was originally released last July and has been available in the states from U.S. Cellular. The Samsung Galaxy S5 mini features a 4.5-inch Super AMOLED screen with resolution of 720 x 1280. This works out to a pixel density of 326ppi. Powering the model is a quad-core 1.4GHz Exynos 3470 CPU with the ARM Mali 400MP4 GPU crunching graphics. 1.5GB of RAM is inside along with 16GB of native storage. A 128GB capacity microSD slot is available for those needing additional memory. The back and front-facing cameras weigh in at 8MP and 2.1MP respectively, and a 2100mAh battery keeps the lights on. Android 4.4 is pre-installed. If the Samsung Galaxy S5 and the soon-to-launch Samsung Galaxy S6 are both too big for you, the Samsung Galaxy S5 mini might just be the best fit for your hands. At 131.1mm x 64.8mm x 9.1 mm, the Galaxy S5 mini may be thicker than those other two models, but it is definitely shorter and narrower than the Galaxy S5 (142mm x 72.5mm x 8.1 mm) and Galaxy S6 (143.4mm x 70.5mm x 6.8 mm). Samsung needs to simultaneously launch 4.7" versions with the SAME SPECS as the Galaxy S phones when they release new models, The S6 mini should launch at the same time as the S6 with the same specs. 65mm wide is the most comfortable width for on-handed operation. I hate Apple, but the one thing they got right was the size of the Apple 6. I guess they'll price it more or less like the z3 compact, yet there will be someone who'll buy it. $440 for Z3 Compact on Amazon. Whoops for Samsung SMH. Really? S5 Mini has been available worldwide for about a year! Wth? What's next? Xperia Z? did you just discover this? Why would anyone want a S5 Mini when AT&T still has Galaxy Alphas? The Alpha is a newer, faster phone and about the height and width, but thinner.